Bob Marley’s widow, Rita Marley, makes her first public appearance since her stroke in 2016. Back in September 2016, Rita Marley became hospitalized due to a stroke. The Marley family didn’t speak much about her condition except to dismissed rumors that she had passed on. Since then we hadn’t seen the Marley matriarch at any major public event until this week when she joined her I-Threes sisters, Marcia Griffiths, and Judy Mowatt at the 2019 Jamaica Reggae Industry Association (JaRIA) award ceremony. The three legendary females were awarded the Iconic Award (for a duo/group). The audience was shocked to see reggae music icon and Bob Marley’s beloved widow, Rita Marley, being brought out on stage in a wheelchair. Some members of the audience moved closer to the front of the stage to get a closer glimpse of her and even popped out their smartphones to snap pictures. “Thank you” and “love you” were the only words she said when she was handed the microphone, but it was enough to warm the hearts of the entire audience. Rita Marley, Marcia Griffiths, and Judy Mowatt formed the legendary I-Threes who was instrumental in the success of Bob Marley. 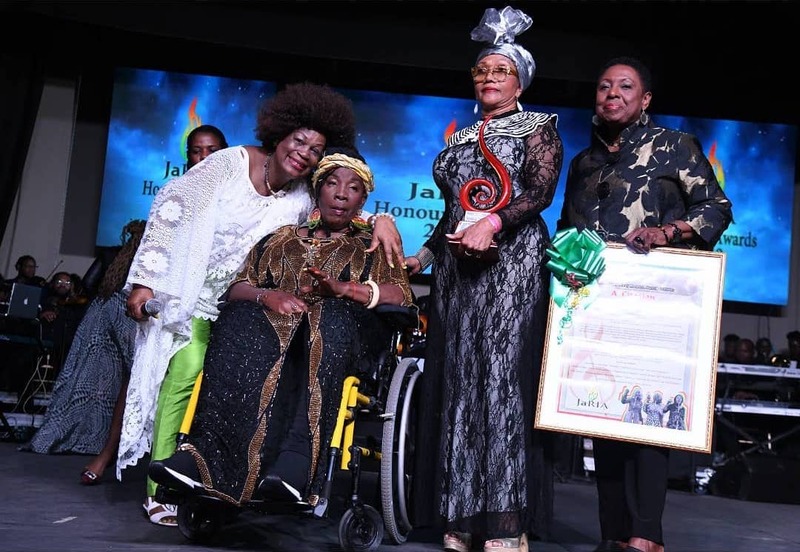 The three women were recognized for their outstanding contribution to reggae music. Rita Marley, Marcia Griffiths, and Judy Mowatt are among the most celebrated females in reggae music’s history. It was a great sight to see Mama Rita, as she is affectionately called, in public. Stephen Marley paid homage to Rita Marley on Twitter while marking International Women’s Day yesterday. ORGAN HARVESTING CRIMINALS LURING FEMALES INTO FAKE HOTEL JOBS IN JAMAICA. JamMediaOne is your news, entertainment, music fashion website. We provide you with the latest breaking news and videos straight from the entertainment industry.